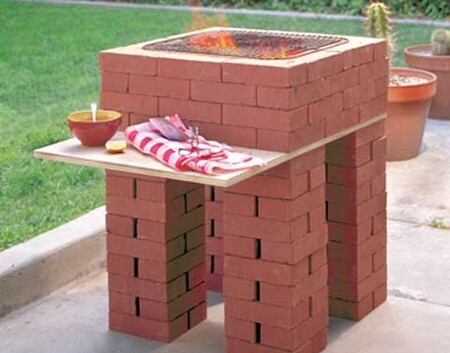 Hi, are you the person thinking about possible ways of outdoor grill construction with the use of bricks? Then here is a solution. Only thing you ought to have is sufficient no of bricks, cement mixture and your precious time. Honestly, grill outdoor is better compared to the usual metal grill. It may be little costlier but it is worth while getting good lifespan of the product. This article is about the construction of our own Brick Grill. We have discussed the main features. First decide the size of your grill that need to construct. Then request a sufficient quantity of bricks at your local supplier to deliver them near your construction site. It is suggested to fix it on a surface which is flat as a cement slab. It is for the reason that you make sure that your work will not get affected by changes due to even surface. It is a best option to build a cooking process area with legs so as to save money. Put a square exactly to the sizing of a normal grill and place four brick in every corners of the square. Place the bricks and cement them up until all the four posts rises up to three feet high. Keep a level above across the poles to make balance of their height. With the help of a saw, make a rectangular wood slap of width that is equal to the columns of the square and length thirty-six inches. Balance the wood slab on the upper end of the four columns which possess eighteen inches overhang on either side. This makes a first-class preparation are with minimum cash. In addition, you can fix the wood slab to the bricks using cement anchors. Place two rows of bricks at the grill base reach up to four corners. Use a mortar which is fire-resistant to close openings or breaks if any in your project. Accidently, a fire from coals may destroy the wood. Then install bricks in two rows which are around the bottom area which is outside to the brick grill using a mortar mix. Redo the same process again on the rear and on both sides until brick rises to eighteen inches. Use a leveler to check whether it is straight. Determine the dimensions of your grill and then look for grate. You look for grate which you will need in your nearer barbecue store. Still you have a remaining considerable budget, and then buy a ceramic coated brick as they are rust resistant. Now we hope that you know all the basics in an outdoor grill construction. You can be hundred percent positive that it will come successful. So, start cooking your favorites.